To Cite: Saki N, Jahani M, Samarbaf A, Kaydani G A, Nikakhlagh S, et al. Correlation Between Tympanosclerosis and Helicobacter pylori, Jundishapur J Microbiol. 2015 ; 8(10):e16069. doi: 10.5812/jjm.16069. Background: Tympanosclerosis is a condition caused by calcification of tissues in the middle ear mucosa that sometimes results hearing loss. Helicobacter pylori is one of the pathological and etiologic factors in the development of tympanosclerosis. Objectives: The purpose of this study was to show the role of H. pylori in the different aspects of chronic suppurative otitis media using the polymerase chain reaction (PCR) technique. Patients and Methods: This case-control and cross-sectional study was performed on all patients with chronic otitis media, candidates for surgical operations, in 2013. They were allocated into the case group with tympanosclerosis and the control group without tympanosclerosis. During the surgical operation, biopsy was done from middle ear and the samples were studied to see if they contained H. pylori using the PCR method. Results: From a total of 19 patients with tympanosclerosis , 16 cases (84.2%) were H. pylori positive, while in the control group 15 (45.4%) cases out of the 37 cases were H. pylori positive, which showed a significant difference (P = 0.002). Age and gender of the patients, ear dryness and perforation size were not correlated with the presence or absence of H. pylori. Conclusions: There is a significant correlation between tympanosclerosis and H. pylori (P = 0.002). This correlation can single out H. pylori as a pathological factor in the development of tympanosclerosis; however, further studies are needed to prove this correlation. Helicobacter pylori is a Gram-negative, spiral and microaerophilic microorganism that was first isolated from the stomach of patients afflicted with peptic ulcer (1, 2). This bacterium can cause gastritis and peptic ulcer in the short-term and carcinoma of the stomach in the long-term (3, 4). Polymerase chain reaction (PCR) is the desired method of proving the presence of H. pylori in tissues due to its high sensitivity and specificity (5, 6). It was previously thought that the human stomach was the sole source of H. pylori; however, it was later found that they are present in human dental plaques, mouth, saliva, tonsils, adenoids, middle ear, nasal polyps and sinus mucosa (7). It is believed that gastroesophageal reflux is involved in many cases of upper respiratory tract disorders including pharyngoesophageal disorders, croup, oropharyngeal dysphagia, rhinosinusitis, otalgia and different forms of otitis media (8, 9). Samples from tonsil and adenoid tissues showed that they might be sources of H. pylori (10, 11). Researchers have proved that there is a connection between chronic tubotympanal disorders and gastroesophageal reflux, but the mechanism is unknown (12, 13). It is suspected that gastroesophageal reflux is involved in the pathogenesis of chronic otitis media. Evidence showed that stomach pepsin is present in the middle ear cavity of patients afflicted with chronic otitis media, as compared to the control group, supports this suspicion (14, 15). Gastroesophageal reflux results in the appearance of otolaryngology symptoms in children and anti-reflux treatments reduce frequency of infection in the middle ear (16). Many studies have been conducted on otitis media with effusion and on its correlation with H. pylori (15, 17-19). However, the correlation between chronic suppurative otitis media and its various aspects, such as tympanosclerosis in which deposition of acellular hyaline and calcified deposits accumulate in the lamina propria of the middle ear has not been sufficiently studied (20, 21). The exact etiology and pathogenesis of tympanosclerosis are not completely known. The aim of this study was to understand the pathology and etiology of tympanosclerosis. So, we decided to use the PCR technique to determine the role of H. pylori in tympanosclerosis. This case-control and cross-sectional study was conducted on patients who were diagnosed with chronic infection of the middle ear and were candidates to undergo surgery in the Imam Khomeini or Apadana hospitals of Ahvaz in 2013. The patients’ demographic information such as age and gender was recorded in the questionnaire. Perforation size and location and the period of ear dryness were recorded. Patients who had operations for chronic infections of the middle ear and those who had ventilation tube inserted into their ears in the past were excluded from the study. All patients underwent mastoidectomy with or without tympanoplasty under general anesthesia. The middle ear mucosa of the patients was examined during the surgical operations and based on this clinical evaluation, they were placed in one of the four types of normal, edema and hypertrophy, hyalinized and sclerotic and polyploid with or without cholesteatoma and this classification was recorded in the questionnaire. During the operations, samples were taken of the middle ear mucosa of the patients. In patients with sclerotic plaques, biopsy of the plaques and of the mucosa around them was performed. The samples were kept under sterilized conditions at 20 degrees centigrade, and were eventually sent to the laboratory of Jundishapur university of medical sciences, Ahvaz, Iran. In the laboratory, DNA was extracted using the Roche High-Pure Template PCR kit (Roche, Germany) according to the manufacture protocol. Primers used to amplify the typing region were VA1-F (A3436) 5’-ATGGAAATACAACAAACACAC-3’13 and VA1-R (C1226) 5’-CTGCTTGAATGCGCCAAAC-3’13 for amplified 286-bp band and VAG-F 5’-CAATCTGTCAATCAAGCGAG-14 and VAG-R 5’-CTAGCGTCAAAATAATTCCAAGG-3’14 for amplified 630-bp. 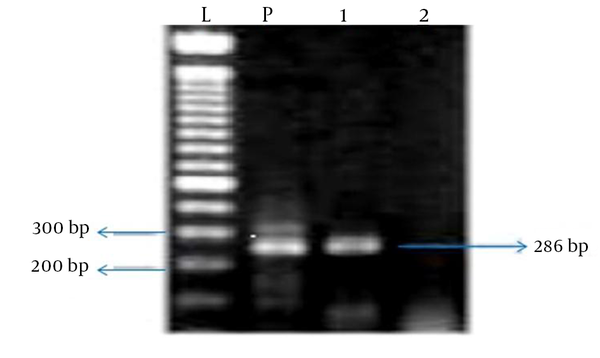 The extracted DNA was amplified using 5 μL DNA template, 0.3 μL Taq polymerase, 1 μL dNTP, 0.25 μL each forward and reveres primers, 2 μL MgCl2 and 5 μL 10X PCR buffer, all mixed in a micro-tube and the ultimate volume reach to 50 μL using nuclease-free distilled water. After activation of reaction in 95°C for 5 minutes, amplification performed for 35 cycles. Cycle program for first pair primers was as: 94°C for 60, 52°C for 60 and 72°C for 90 seconds. A final extension 72°C for 5 minutes was the ultimate step of cycles. For the second pair primers, cycle program was as: 94°C for 30 seconds, 56°C for 60 seconds and 72˚C for 90 seconds. Polymerase chain reactions were performed using the Peqlab thermocycler (Roche, Germany). The data were analyzed using SPSS software version 18. The chi-squared and the independent-samples t-test were also used to analyze the data. The selected level of significance was P < 0.05. Fifty-six patients participated in this study, of whom 29 (51.8%) were men and 27 (48.2%) women. Their average age was 31.7 years old (standard deviation = 8.7). The biopsy samples of the middle ear mucosa of 31 (55.4%) patients were H. Pylori-positive. Of the 29 male patients, 15 cases were (51.7%) H. Pylori-positive, while of the 27 female patients 16 cases (59.3%) were H. Pylori-positive. This difference was not significant in Pearson’s chi-squared test (P = 0.571). The average age of H. Pylori-positive patients was 30.3 years old (standard deviation = 7.6), while the average age of H. Pylori-negative patients was 33.4 years (standard deviation = 9.7). This difference was not significant in the independent samples t-test (P = 0.571). Therefore, there was no significant correlation between the presence of H. pylori and the age and gender of the patients. The most common pathological type of middle ear mucosa was hyalinized and sclerotic type in 19 cases (33.9%). The polyploid type with or without cholesteatoma type was reported in 15 (26%) cases and the edematous and proliferative type with 12 (21%) cases. Examination of the middle ear mucosa of the 19 patients of the hyalinized and sclerotic type revealed that 16 (84.2%) were H. Pylori-positive (Figure 1) and 3 (15.8%) were H. Pylori-negative; while of the 37 patients whose middle ear mucosa was not sclerotic,15 cases (40.7%) were H. Pylori-positive (Figure 2) 22 (59.3%) H. Pylori-negative. This was a significant difference (P = 0.002), which means there was a correlation between the presence of H. pylori and tympanosclerosis of the middle ear (Table 1). As for other types of middle ear mucosa (normal, polypoid with or without cholesteatoma and edema with hypertrophy), there was no significant correlation between them and the presence of H. pylori. L = ladder (100 bp), P = positive control, Lanes are numbered in the following order from 1 to 2: case H. Pylori-positive (286 bp), case H. Pylori-negative. L = ladder (100 bp), P = positive control, Lanes are numbered in the following order from 1 to 3: case H. Pylori-positive (630 bp), negative control, case H. Pylori-negative. Results showed that 26 (46.4%) of 56 patients had dry ears for at least three months before surgery. Of the 30 patients who did not have dry ears, 13 cases (34.3%) were H. Pylori-negative and 17(56.7%) were H. Pylori-positive. This was not a significant difference in Pearson’s chi-squared test (P = 0.832). Moreover, 31 (53.6%) of 56 patients had perforations more than 50%. 40 (45.2%) of the 31 patients with perforations of more than 50% were H. Pylori-negative and 17 (54.8%) were H. Pylori-positive. H. Pylori was not significant in Pearson’s Chi-squared test (P = 0.931). Therefore, there was no correlation between the presence of H. pylori and the size of the perforation or dryness of the middle ear. Zollner (22) was the first to use the term tympanosclerosis in 1956 to describe a common complication resulting from middle ear infections. Tympanosclerosis is an abnormal condition in the middle ear cavity in which lime particles accumulate in the tympanic membrane, tympanic cavity and ossicular chain (23, 24). It is a long-term complication of infections of the middle ear (4, 25-27). In available reports, the prevalence of tympanosclerosis varies from 14.1% in Bhaya’s report (28) to 35.64% in Wu’s study(21). Despite the extensive available information on the clinical, histologic and pathologic aspects of tympanosclerosis, its pathogenesis is not known. Tympanosclerosis is observed as irreversible changes in the temporal bone (13, 24). It is thought that gastroesophageal reflux may be involved in the pathogenesis of otitis media and evidence indicating the presence of stomach pepsin in the middle ear cavity of patients with otitis media, as compared to the control group, confirms it (14, 29). Gastroesophageal reflux results in the appearance of otolaryngology symptoms in children and anti-reflux treatments make frequent middle ear infections go away (16). Many studies have been conducted on otitis media with effusion and on its correlation with H. pylori (15, 17, 18); however, the correlation between chronic suppurative otitis media and its various aspects such as tympanosclerosis has not been sufficiently investigated. In tympanosclerosis, the process of deposition of acellular hyaline and calcium deposits in the lamina propria of the middle ear takes place, following which it is even possible for fixation of ossicles to occur leading to conductive hearing loss (20). The exact etiology and pathogenesis of tympanosclerosis are not completely known (9). In some studies, tympanosclerosis has been observed also as a complication of frequent otitis (21, 29). In a recent research, it has been suggested that H. pylori is the pathologic factor in tympanosclerosis (21). In our research, designed to study the correlation between H. Pylori and tympanosclerosis, we found that H. Pylori has a prevalence of 84.2% among patients with suppurative infection of the middle ear, while its prevalence was 40.5% in patients without tympanosclerosis. This difference (P = 0.002) indicates that H. Pylori plays a role in the pathogenesis of tympanosclerosis. Iriz et al. (26) showed that there are similar risk factors, such as increased homocysteine levels, between coronary artery atherosclerosis and tympanosclerosis. Although tympanosclerosis and atherosclerosis are two separate pathologies, they have similar histological and pathophysiologic elements and the same genetic reason has been proposed for both (2). Ameriso et al. (30) studied evidence concerning the development of inflammation caused by H. Pylori in 38 patients with atherosclerotic plaques who had undergone endarterectomy and found that in most of these patients H. Pylori was correlated to the inflammation, which indicated the correlation between H. Pylori and atherosclerosis. Moreover, the findings of the study conducted by Akiash et al. (31) show that contact with H. Pylori increases the risk of cardiovascular diseases even in the absence of other risk factors. Our findings suggest that H. Pylori probably plays a role in the development of tympanosclerosis. Iriz et al. (26) carried out a case-control study and found that 100% of the patients with tympanosclerosis were H. Pylori-positive while only 26.9% of the patients not suffering from tympanosclerosis were H. Pylori-positive (P < 0.01) (21). Results of our study, while confirming those of Iriz et al. (26), were different. This difference could be due the method used in the identification of H. Pylori. Iriz et al. (26) used the campylobacter-like organism (CLO) test in H. Pylori identification, while we employed the PCR method. Since the PCR method is more accurate than the CLO test, our results are probably more acceptable than those Iriz et al. (26) found. Our study and that of Iriz et al. (26), both show that there is a correlation between the presence of H. Pylori and tympanosclerosis, and suggest the presence of H. Pylori as the etiology for this disease; however, neither study can consider H. Pylori as the definite pathogenesis for tympanosclerosis. To prove this correlation, a study should be designed to evaluate the correlation between tympanosclerosis and H. Pylori by considering those pathological changes found in the examination of the middle ear mucosa that attribute the presence of inflammatory symptoms to the activity of H. Pylori in the middle ear. This study offers a better understanding of the etiological and pathogenic aspects of H. pylori in tympanosclerosis that can be used in designing new treatment methods for this disease. The authors would like to thank the research deputy of Ahvaz Jundishapur university of medical sciences for their valuable cooperation. This research was a result of a otolaryngology physician thesis (Ref-No. 89191).